Will Trump’s Approval Rating Be A Problem For Republicans In 2018? President Trump during a news conference in the East Room of the White House with Japanese Prime Minister Shinzo Abe on Friday. President Trump’s approval rating is a matter of some debate. One cluster of polls (e.g., Rasmussen, Morning Consult) reports that more Americans approve of his job performance than disapprove of it. Another puts him underwater by anywhere from 7 percentage points (YouGov) to 15 points (Gallup). What’s not in question is that Trump’s approval rating is historically low for a new president. Typically — even following bitter elections — incoming presidents enjoy a honeymoon period after the country rallies around its new leader (and before the opposition begins to coalesce). As Harry Enten wrote last month, every new president since Harry Truman in 19451 has enjoyed an initial net approval rating2 of at least +32 percentage points — until Trump. On average, pre-Trump presidents kicked off their administrations with a 66 percent approval rating and just a 10 percent disapproval rating. Gallup’s first survey on Trump put him at 45 percent approval and 45 percent disapproval. Trump’s historic unpopularity provides a glimmer of hope to Democrats, who are currently shut out of power in every elected division of the federal government. “Maybe, just maybe,” the thinking goes, “a backlash to Trump’s policies could jump-start a Democratic wave that could flip control of Congress in 2018.” But can poor approval ratings today really help predict an election that’s 21 months away? The answer is a big fat “maybe.” If Trump is this unpopular when the midterms come around, Democrats could be in for a good night. But Trump has already broken the traditional mold of presidential approval, making it hard to say where his popularity will go from here. Right now, with a Gallup net approval rating of -15 percentage points (40 percent approval, 55 percent disapproval), Trump looks like he could slot in right alongside these underachievers. But there’s a huge caveat: Approval ratings can change a lot in 21 months. Trump could have a successful and productive first two years that win over the support of the country; outside events could cause Americans to rally around their leader as they did in 1962 and 2002. However, Trump is fighting history here, too: Presidents’ net approval ratings almost always go downhill from this point in their terms. Includes only newly elected presidents; Lyndon Johnson and Gerald Ford are not listed. Change in ratings is from around three weeks into a presidency to the president’s first midterm elections. Only George W. Bush improved his net approval rating from around three weeks into his presidency to his first midterm elections; the net rating for the other eight newly elected presidents decreased by at least 17 percentage points. Notably, it’s not unusual for a president’s raw approval rating to stay at strong levels. But it is a near-inevitable increase in his negatives that drives the change. Every newly elected president since Eisenhower, including Bush, has suffered an increase in his disapproval rating — most by at least 20 percentage points. If Trump’s net approval rating follows suit (as it may already be starting to) and drops further between now and November 2018, it will be lower than that of any midterm president in the polling era. In that case, history suggests that Republican legislative losses could be severe. For the GOP to lose control of Congress, it would have to end up with a net loss of 24 seats in the House4 or three seats (albeit in deep-red states) in the Senate. Those are realistic possibilities amid an unpopular first-term presidency. Clinton, Obama and Reagan all lost at least 26 House seats; no one with a positive net approval has lost more than 18. However, there are plenty of reasons to question whether the pattern will hold true for Trump. For starters, all preceding presidents’ approval ratings started from precipitous heights; many had nowhere to go but down. Trump, by contrast, is beginning his presidency relatively unpopular; he has plenty of room to improve. If newly elected presidents tend to revert to the mean, Trump is starting from a pretty average place. 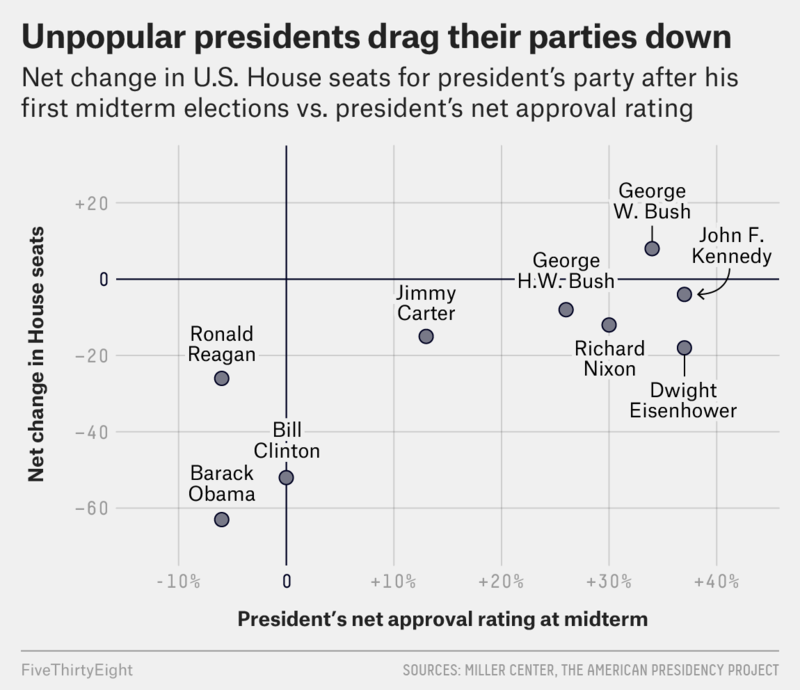 Moreover, the relationship between net approval and midterm losses is far from perfect. Other factors clearly play into midterm election results as well, and in 2018, those factors will work against Democrats: They face a Senate map with few opportunities for gains and a House map skewed red by urban packing and gerrymandering. Although history implies that the Democrats should make gains, these structural barriers could hand that advantage right back to the GOP. As far back as there is polling from Gallup, which is the pollster that has asked the approval-rating question the longest. The percentage of people who approve of the president’s job performance minus the percentage who disapprove. We’re not counting Lyndon Johnson’s and Gerald Ford’s first midterms here since they were not initially elected to the presidency and therefore their first midterms came under unusual circumstances and were oddly timed. Assuming that the incumbent party holds the three currently vacant seats previously held by Xavier Becerra, Mike Pompeo and Tom Price.